Recently I talked with two good friends of mine about their dreams and what they really want to do. However, at the moment they are not doing it. When speaking about the topic and digging a bit deeper, there are some obvious things that could immediately give them a kick-start to get going. “So why not directly go for it?” I asked. It seemed obvious to me. But there was also the pattern that there is something, which has to be done first. In the one case it was that there is money needed and in order to move to what I want, I need to get the money to start that – so I have to work here to get the money first. In the other case there was the pattern that I have to get better first and then I can get what I want. Is this really so? Aren’t there any alternatives where one can get in the right direction and earn money doing it? Or is making one move ahead not the best opportunity to improve the skill you need the most? I believe that there is always another alternative to get to where you want to go. But you have to look for it with eyes open, and with the courage to act outside of your comfort zone. I mean, what is the worst thing that can happen if you apply for the job, or if you ask the girl out, or if you ask for a business-appointment? The worst thing is usually a “No”. But that is not really the problem. What is the problem is the fear of it and what it will do to our self-image and self-esteem. If you can move beyond that fear and see what a “No” simply is without interpreting anything into it, it really becomes just that. And it not only becomes that, no – it really is the fastest way to move ahead, to accelerate. If you get the “No”, so what? You learned how not to succeed. Thomas Edison who eventually invented the light-bulb said: “I have not failed. I’ve just found 10,000 ways that won’t work.” You don’t need 10,000 attempts, but the basic point is this: you learn from it and make the next move with this knowledge. Eventually you will succeed and you will succeed much faster this way. The fear of failure is an illusion, as long as you don’t interpret a “No” as a failure and give up, but as a valuable learning lesson towards what you want. The key here is to have your goal in mind and know that you will get it. Anything becomes a stepping stone then towards it in one way or the other, meaning learnings or real progress. And by the way, as strange as it sounds, there is also the fear of success. What happens when I succeed? Then I really have to take responsibility for what I am and do!? Is this really what I want? So fear of failure is not the only reason of that feeling of “not yet being ready”. There is also the area of uncertainty, of not really having decided to fully go for it. To fully commit to something creates a huge amount of energy towards it. If you do this, if you decide fully for something, you cut off all other possibilities in that moment and that creates clarity and drive. You then become like an arrow flying towards your goal. The second thing after committing to what you want is to break it down into actual doable steps. This is called creating an Action-Plan. So you take the whole “huge” thing at break it into small serial steps that you can focus on one at a time. Then even the greatest project becomes doable, just by starting the first step. Thinking from the end is a great way to get the Action-Plan going and I already described this at reviewing the second habit from 7 Habits of Highly Effective People . And then there is a simple but profound truth: success is a build-up of small successful steps. Sure, there may be greater leaps, but seldom did I start anything with a breakthrough. ;-) The thing is if you move ahead with courage just one step, you move into a new perspective with new opportunities arising. Those may be new people that come into your life or new insights you learn during the process. Often you can not see these opportunities from the current state. You don’t have to be perfect at the first step. In fact trying to be perfect is a great way to become frustrated. Voltaire said “The perfect is the enemy of the good.” And what he meant by that is, that if you try to be perfect right from the start, you have set an incredible high goal. If you go for good you will make progress fast and then you improve further towards “perfection” – or maybe even better to say: something great or outstanding. Change your belief about failure – there is no such thing, unless you give up! There are only learning experiences on your way to succeed. Clearly decide what it is you want, in detail – set it as a goal, and then commit fully to it. Break it down into small steps and begin with the first. Don’t make it a huge deal at the beginning, start with the first step – the second step is already from a broader perspective. 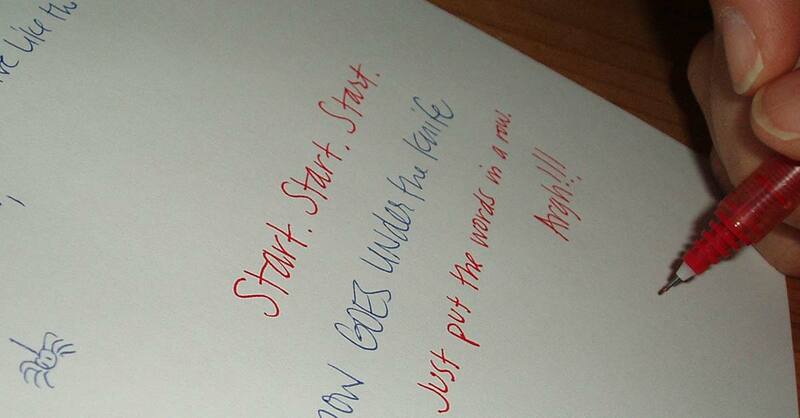 I wish you good luck starting, whatever it is get started now! If you have anything to add, please write it directly to the comments. James, thanks for your feedback. In order to develop meaningful goals connect with your desires: If you knew you could not fail, what is it that you really wish to have and to do? A good starting point is Ignite Your Burning Desire. Btw. if you are on my Free Personal Development Newsletter, you will get this message too, including the steps before which will prepare you to tap into your desires and set the right goals for yourself. Brainstorming goals and then make them happen is the topic of 7 Steps to Set Your Life Goals. I love your website, especially the article on getting started and having definite goals, but what if you don’t have any idea of a goal? I am 36 now and work as a bus driver in London, UK. Hate the job – utterly unfulfilling, and way beneath my skills and talents, although driving is one skill I have. Never known what I wanted to do, except what I do NOT want to do! Any ideas? Great post! I was googling for a quote and came across your page, and I’m glad I did! I love how you challenge the idea of failure – what IS failure anyway? Even if things go horribly wrong, it was probably a learning experience right? I also really appreciate the “multiple routes” approach you have to your goals. There’s rarely only one right way to do something. Thanks for the insight! Getting started is hard, but I also feel like one of the biggest challenges is continuing what you started, I face that challenge all the time. I have fallen prey to all four of these excuses. It is refreshing to now take steps, no matter how small, instead of waiting to take a giant step. That was a refreshing post. I have to say I really liked the view on failure being like a stepping stopne to success, when we learn to see it as a necessary learning experience. Very helpful view to remember everytime we are about to starting something.